One of my favorite film industry magazines is Moving Pictures Magazine. This well written and thought provoking publication offers balanced insight and engaging commentary about film. This month's Morality issue (Oct/Nov 06) features four pages of illustrations from Gallery of the Absurd along with an interview with the 14. Much thanks to Elliot V. Kotek and Brittany Brenner. This vintage-style pulp novel is modeled after those fantastic sci-fi paperbacks of the 50's and 60's. In this twisted story of unleashed terror and spine-tingling horror, a mad scientist clones Nicole Richie in order to add to his macabre collection of human curiosities...but his experiment goes terribly wrong when the clones continue multiplying. Forming an unruly mob, they break out of the laboratory and begin to terrorize the beaches across the U.S. Can these angry starving clones be stopped before it's too late? This Halloween parody created with ink and digital color. Gallery of the Absurd has been posting several Halloween-themed paintings during the month of October. Dracula, skeletons, space aliens, Donald Trump....all are fodder for chills and nightmares. One of the scariest images we saw this year was the Star magazine cover photo of a skeletal Nicole Richie struggling to run down the beach. 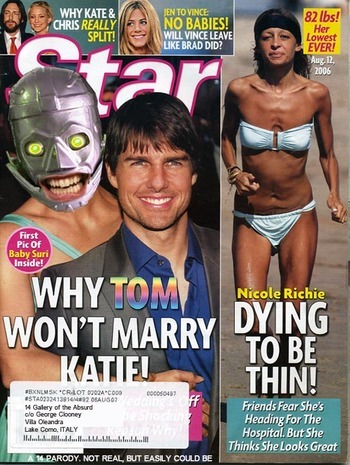 Interestingly, she looks cute in many of the photos that were taken of her that day, but Star managed to find the most horrifying photo in the batch and in classic tabloid maneuver, featured it on the cover. We hope our subscription never runs out. Medium: Star magazine cover manipulated with a little Photoshop. 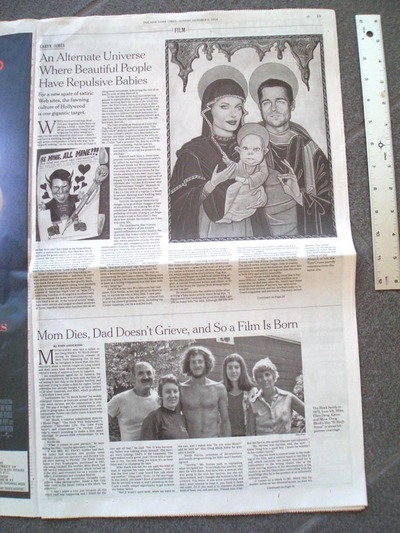 The article appeared in the Arts section of the Sunday, Oct. 8th issue of The New York Times and was so large we had to take a picture of it as proof. Even then, we still couldn't believe how LARGE it was. We're still in a state of shock. Read the article here. Much thanks to the NY Times! 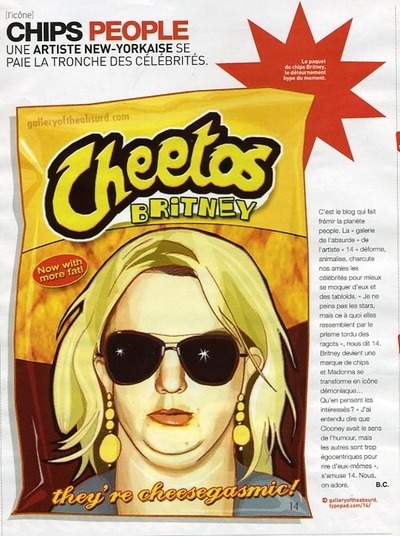 Much thanks to Max magazine, Gallery of the Absurd is honored to have appeared in your October 2006 Anniversary issue.